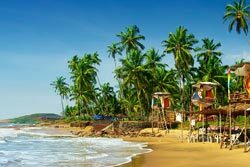 Beautifully tucked into the Western coast of India, Goa is though the smallest Indian state, its larger than life spirit makes its big. With some of the most beautiful beaches weaved together, it is the real beach paradise of India welcoming travellers from all over the world. Nightlife of Goa needs no introduction. The state hosts some of the most pulsating parties after dusk which transform it into a party ground for veteran party goers. One of the most visited beaches of Goa, Calangute Beach is the biggest beach of North Goa. This remains busy with travellers and locals alike and brims with life all day long. This is a great hub to try a plethora of water sports apart from cherishing beautiful views of the sea. The beach is nestling with numerous beach shops where one can shop and have a whale of a time. A popular attraction among young crowd, Baga Beach is just 30 Km North of Panaji. The beach is nestling with some of the best nightclubs, including Britto's, Tito's and Mambos. One can see numerous shacks lined up along the coastline where one can relax with a cocktail in hand. One can also indulge in water sports here which bestow great pleasure. This is a serene escape known for its unparalleled natural beauty. The beach is away from usual crowds and is visited by those looking for some serene time amidst nature. The beach flaunts rock formation around the white sands which look beautiful. This well-preserved 17 century Portuguese fort is situated on the Sinquerim Beach. The fort was raised against Dutch and Marathas as the main defence of Portuguese. It is surrounded by thick battlements which look huge. It also houses a 13 metre high lighthouse apart from a vaulted cistern with a storing capacity of ten million litres of water. Another popular fort of Goa where numerous Bollywood movies have been shot, Chapora Fort is mostly in ruins today. However, it still preserves an old world charm which brings numerous photographers to this historic wonder. The surroundings of the fort look majestic and it remains a great place to spend some moments of peace. One cannot miss out the churches of Goa as they underline the existence of Portuguese in the state in history. Basilica of Bom Jesus is a UNESCO World Heritage Site located in Old Goa. The church features a marble floor decorated with precious stones. Its gilded altars and displays of paintings depicting the life of St. Francis Xavier look majestic. Goa is known for its variety of sea food. It serves a mix of Konkani, Hindu, Portuguese and Catholic cuisines. The main ingredients in all the local dishes include seafood, coconut milk, rice and local spices. Fish curry and rice is loved by all locals here. Do not forget trying sea food like prawns, lobsters, crabs, pomfret fish, clams and ladyfish. These dishes are available in both beach shacks and local restaurants. 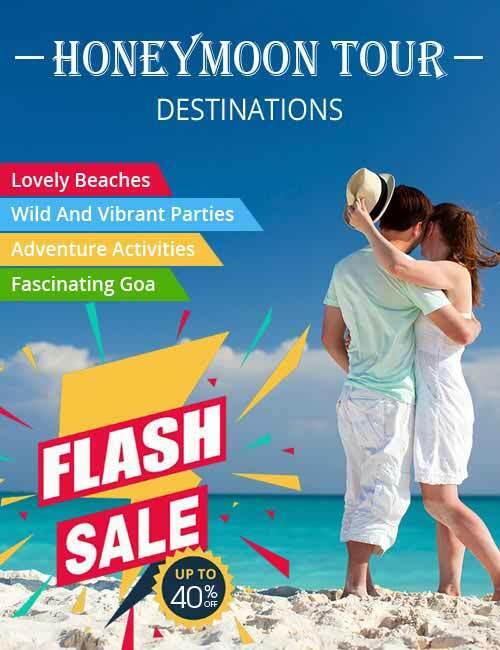 Goa is a dream for shopaholics. Shopping in Goa means exploring the vibrant local markets, interacting with happy vendors and buying some funky stuff which give great pleasure. The Mapusa Market is ideal for buying antiques, textiles, traditional handicrafts, Goan pottery, and much more. Anjuna Flea Market, held every Wednesday, is loved by travellers and locals alike. Here you can find almost everything at knock down prices. Calangute Market Square remains bustling due to its convenient location at the beach. The market is good for buying sarongs and trinkets apart from accessories, textiles and carpets. Also, the Saturday Night Bazaar at Arpora must not be missed. The market brims with endless choices of carpets, embroidered textiles, hammocks, clothes and accessories. Goa is well connected with rest of the world via Goa International Airport located at Dabolim. The airport receives daily flights from major cities like Chennai, Mumbai, New Delhi, Hyderabad, Cochin and Bangalore. Goa houses two major railheads - Madgaon and Thivim which are well linked to rest of the country. Also, one can easily enjoy road travel to the state as it has a well planned road network.